Voting Results (Top 3): Angel Hernandez (16%), Larry Vanover (15%), Phil Cuzzi/Marty Foster (6%). Angel Hernandez is the Umpire Ejection Fantasy League's 2016 most improved umpire of the year, which marks his third consecutive season receiving an award (2014 Noteworthy Umpire) and second consecutive season receiving the Most Improved Umpire award (2015). In his 26th Major League Baseball umpiring season, Hernandez ejected three people, including one Spring Training ejection and two regular season balk ejections; he ejected two in 2015, as well, and three in 2014. Prior to the regular season, the Cuban-born Hernandez represented MLB as one of two umpires (Laz Diaz) assigned to officiate the MLB in Cuba Rays vs Cuban National Team exhibition in Havana; it was Hernandez's second visit to the island in a span of over 50 years. In the postseason, Hernandez continued his journey into October with a National League Championship Series assignment (his last LCS was in 2010) during which he featured in a prominent Replay Review "call stands" ruling on a play at the plate, while sharing a moment of sportsmanship with Cubs batter Anthony Rizzo during a mound visit at Dodger Stadium. Several commenters have noted a significant improvement in Hernandez's game since his assignment to veteran chief Ted Barrett's crew. For his part, Barrett won the UEFL's Crew Chief of the Year Award in 2014. Hernandez's 95.9% plate score was the second highest of the 2016 LCS (Jim Wolf, 98.6%). 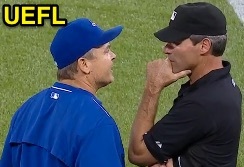 Angel Hernandez now has 8 points in the UEFL Standings (7 Previous + 1 Award = 8). The next postseason award, Fill-In Umpire of the Year, will be released tomorrow.